Hegarty’s works have been performed in New York, Montreal, San Francisco, Chicago, St. Louis, Brisbane, Marseilles, and Barcelona. 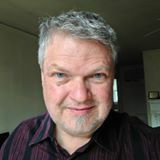 He has received several awards and grants including a NEA grant to develop and produce his multimedia opera, The Soul of the Rock in New York in 1997. Hegarty’s electronic recreation of history’s the first opera, Euridice Remix was performed to a standing-room-only audience at the Contemporary Art Museum St. Louis in the spring of 2002. He was a featured composer at the 2002 Bonk Festival of New Music in Tampa, Florida. He has performed recently in St. Louis at the Galaxy and at the St. Louis Art Museum on concerts presented by the New Music Circle. Other multimedia works include Talking to Myself, premiered in St. Louis in 1998. The video ballet Thin Girls Dancing premiered in St. Louis in 2000. He is the recipient of arts grants for works including Steal Away for orchestra and children’s chorus. He has had several electroacoustic compositions presented at the national conferences of the Society for Electroacoustic Music in the United States. Noixe was presented at the Australasian Computer Music Conference in Brisbane in 2000 and at the Bonk Festival of New Music in 2001. Since 1997 he has been the head of the music department at St. Louis Community College at Forest Park. Hegarty studied with James Phelps at Northern Illinois University.